This genuine UK 1st pressing of their debut album dates from initial April 1964 release. 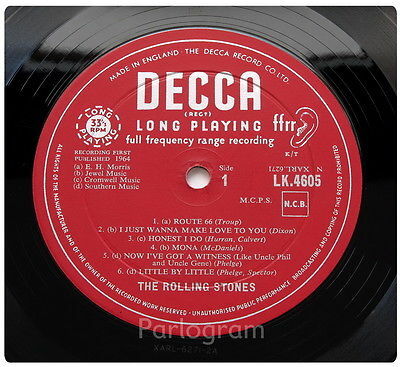 This pressing is notable for having a unique, shorter/demo version of 'Tell Me' lasting 3.02m, as opposed to the more familiar 4.06m take which is included on all subsequent pressings. Housed in a front laminated, non-flipback flipback 'Printed in England' & original poly-lined inner-sleeve. Both are vibrant and unworn with nothing more than a small number of light spindle trails around each centre hole. This well looked-after, little played disc has clean, unworn playing surfaces which retain all of their deep-gloss shine. The only visual blemish is a small pin-head sized mark on track 4 on side 1 which is just feelable beneath the fingertips. Without this mark, the disc would have graded 'EX+'. Closer inspection beneath halogen light reveals only some harmless wispy inner-sleeve removal marks and a sparkling rainbow shine. In addition, both sides lie 100% flat on the turntable when playing. Unlike most copies of this album, this has in no way been overplayed or damaged by play on poor-quality equipment. All tracks sound fresh and clean and are free from groove/play wear distortion. Again, we have downgraded slightly due to the aforementioned mark which on our system causes the stylus to repeat/stick a groove on 'Mona'. It may play differently on another system, but please be aware when bidding that there is a fault here. There are also two light clicks on 'Honest I Do', but no further significant faults or distraction elsewhere. Fully intact with moderate handling and storagewear throughout. The rear panel has some discolouration associated with age but is free form any writing or missing paper. Both seams and the spine are fully intact. This LP will be shipped inside our new & exclusive custom-made LP mailer (above), which guarantees it reaches you in the same condition it leaves us.